The first Soviet WIG was designed by Italian emigre engineer Roberto Bartini while working with the Beriev organization. His theories were put into practice which produced the giant VVA-14. As in the mailed fist? Idont understand what you mean. flyernz was trying to be funny. In your post you accidentally left out the "r" in "first". Chain mail was the type of protection knights wore on the arms, legs and hands, hence the English term a 'mailed fist'. Just a bit of English speaker humour there. Thanks Ross. I never was great at spelling. There was once a black knight, would that have been black - mail? Here is a link to an online book - "Russian Seaplanes and Ekranoplans - 1910-1999" by G.F. Petrov. It has a lot of 3-views and data, but it's all in Russian language. Thanks. Thats an interesting book. Where do i get a copy? I'm sorry for bumping this thread up, I just want to make some thing clear. 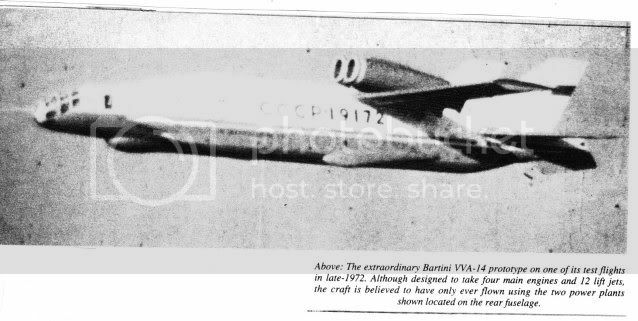 First of all the VVA-14 wasn't the first Soviet WIG craft. 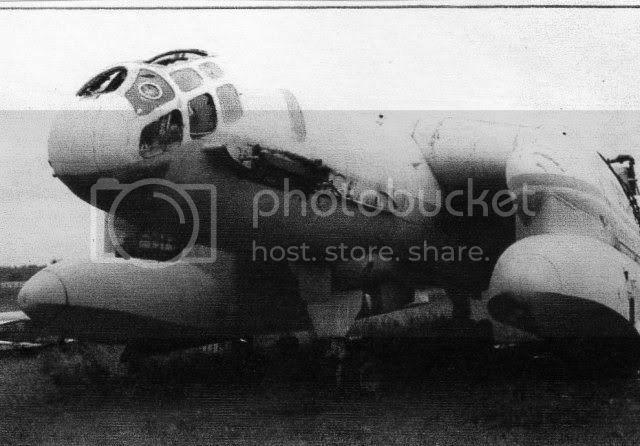 As far as I know the very first one was the SM-1 designed by Alekseyev and built in 1961. Secondly, VVA-14 was designed as a ASW VTOL seaplane, not a WIG craft. The initial prototype was built in 1972 without VTOL capabilities, just to test the plane in regular flight and take off/landing modes. It was painted in a fake Aeroflot livery to conceal it's true purpose. 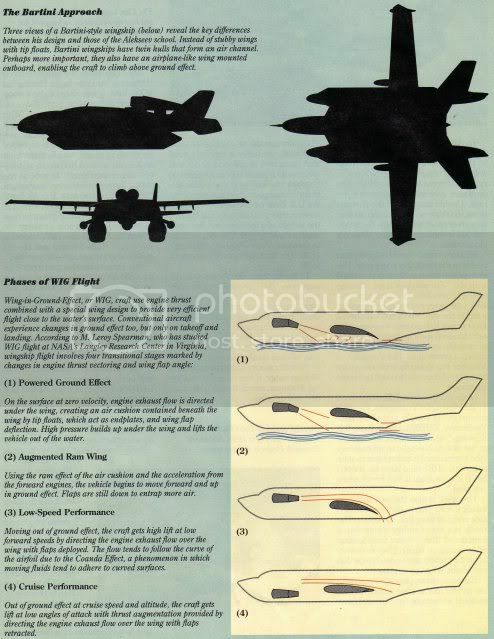 In 1975 the program was cancelled and the prototype was converted into a WIG craft by lengthening the fuselage, replacing the inflatable floats with rigid ones and adding two more jet engines on the nose for additional lift during take-off. One of the reasons for this conversion was the fact that VVA-14, according to test pilots, behaved extremely well when flying low above water surface. The new craft designated 14M1P was not a pure WIG, it was able of both WIG and regular flight. he finished study on Politecnico di Milano and become member of comunist party there. Bartini was born in Fiume, Austria-Hungary (now Rijeka, Croatia).He was the son of an unmarried 17 year old girl. Her aunts and tutors, impoverished aristocrats originally from the city of Miskolc, North-East of Budapest, granted custody of the child to a peasant family. When the natural father of the child, a married man, refused to recognize the baby as his son, the young mother drowned herself. Besides excellent family education, in 1915 he graduated from gymnasium, was drafted and sent to school of officers' reserve located in the town of Banská Bystrica (today's Slovakia). Upon graduation in 1916, Bartini was sent to the Russian-Austrian-Hungarian front where he was captured in June 1916. He attended flying school in 1921 and Politecnico di Milano in 1922. Bartini became a member of the Italian Communist Party in 1921. After the Fascist takeover in Italy in 1923, he was transferred undercover to the USSR as an aviation engineer. He occupied several engineering and command positions in the Soviet Air Force and Red Army. He became the head of the department of amphibious experimental aircraft design in 1928. He was the head of the design department of NII GVF, general designer (chief designer), since 1930. He was imprisoned from 1938 to 1946. 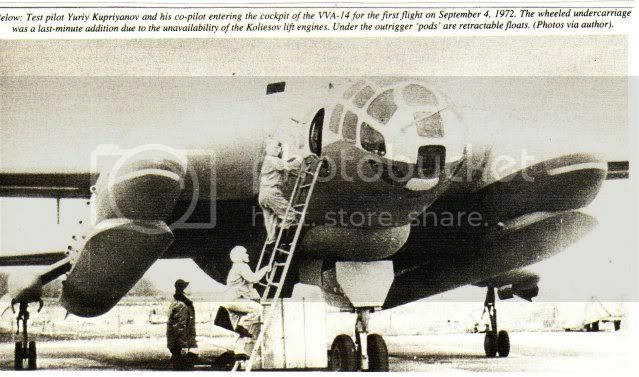 He continued his work on new aircraft designs as a prisoner in TsKB 29 NKVD and in OKB-86 on the territory of Dimitrov Aircraft Factory and Beriev Aircraft Company in Taganrog (1946–1952), then in SibNIA, Novosibirsk. R.L.Bartini was rehabilitated in 1956.